I've had to resign myself to the fact that whenever I enter the doors of a Poundland store, I'll leave with ten times more stuff than I originally planned. More often than not, this is because I've found a good bargain on Weight Watchers foods. 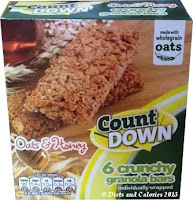 But on my recent visit I noticed a new brand of granola cereal bars called 'Count Down'. 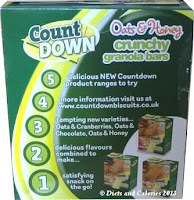 With a name such as 'Count Down' it seemed likely they might be aimed at the calorie conscious market. And they were. Taking a glance at the nutrition label, it turned out each bar has 90 calories. Since that's under my 100 calorie snack limit, I picked up a pack, paid my £1 and took them home… along with all the other 'stuff' I didn't plan on buying. 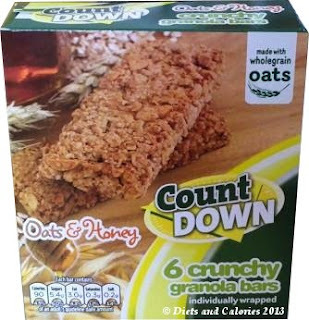 The Count Down Cereal bars are available in three varieties: Oats & Cranberries, Oats & Chocolate and Oats & Honey. Only the Oats & Honey were in stock which was fine with me as that’s the flavour I'd choose anyway. 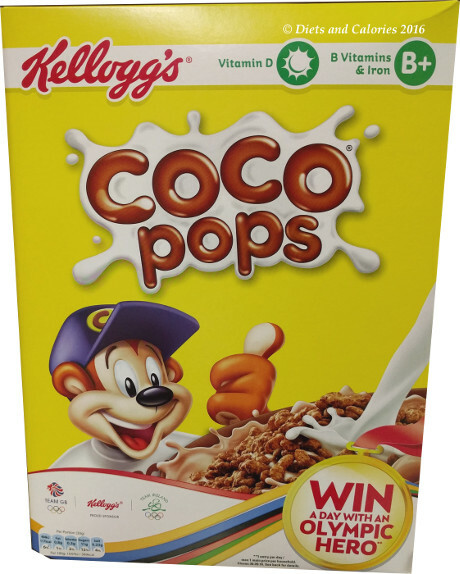 Each box contains 6 cereal bars individually packed inside a clear wrapper. I like this as it’s nice to be able to see what you’re about to eat before unwrapping it. 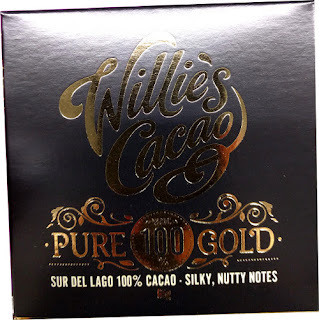 As for the taste, they're pretty good. They're very much like a crispy flapjack (on the inside) with a noticeable honey flavour which isn't too overpowering. I say on the inside because the outside of the bars were a bit dark around the edges, giving them a slight burnt flavour. Maybe this batch were left in the oven a bit too long. But the inside was very tasty. 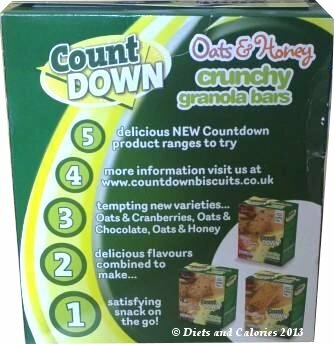 The Count Down range is probably produced just for Poundland so may not be found anywhere else. They're made by Rivington Biscuits Ltd., in Wigan. Good nutrition points: no artificial colours, flavours or preservatives; natural fibre from oats; made from more than 50% wholegrain oats. Not so good: High in sugar. 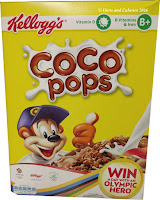 Ingredients include: wholegrain oats, sugar, sunflower oil, honey, salt and cane molasses. Suitable for vegetarians. Nutrition information per 21g granola bar: 90 calories, 2.1g protein, 13.5g carbs, 5.4g sugars, 3.0g fat, 0.3g saturates, 1.5g fibre, 0.2g salt.